research (and numerous fine restorations) have provided much valuable information. Lathe production began on Long Island, in New York, during 913 and remained there until 1925 when, having never made a profit, and being forced into liquidation, production was moved to a site occupied by a newly-formed organisation, the Dalton Tool Co. located at Sound Beach Ct. This new company enjoyed a well-equipped plant where castings could be poured and parts and accessories machined for lathes and other lines. Court records from 1933 show that Mr. Dalton refunded creditors some $365,000 from his own pocket, a deep one almost certainly filled by profits from his other interests including the extensive South Beach Plant (constructed in the early 1920s and first occupied by the Welte-Tripp Pipe Organ Company). The papers appear to show that, although production of lathes was officially moved to South Beach during 1925, the New York address was still being used - some New-York-built machines being discovered with their address details on the gear chart overlaid with a small tag giving the South Beach location. 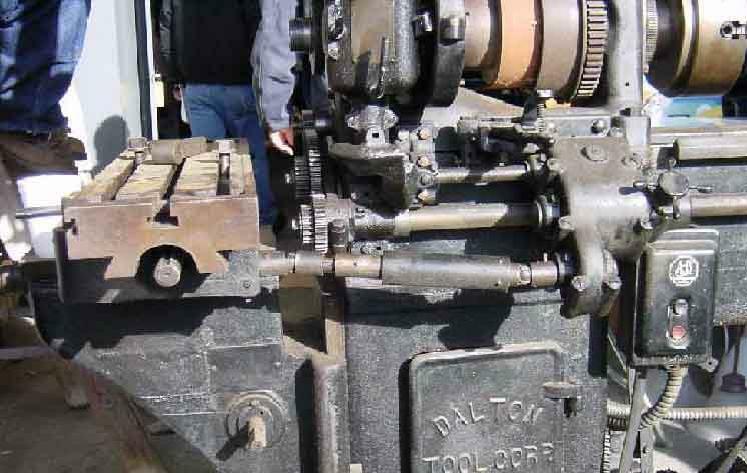 The youngest Dalton known (and hence the last machine built so far discovered) is Serial 7014, manufactured in 1929, though production may have continued for a little into the years of the Great Depression. After being vacated by Dalton, the South Beach plant was taken over (in 1931 or 1933 and complete with all the existing machine tools for the production of lathes) by the Swedish vacuum cleaner company Electrolux as their first American factory. Production of lathes began, it is believed, with the "OT" Series, a 3.5-inch centre height machine of light build. The various models were then built in numbered "Lots", this being a feature of Dalton lathes - though some were assigned Model Type designations instead. Each "Lot" (they ranged from No. 1 to 6) or Model was assigned its own sequential set of serial numbers - a fact that came to light when duplicate numbers were found, but on different Lot Number or Models Types. All Dalton lathes, other than the Lot 1 combination machine, have "Dalton 6" cast into their bed or on a tag on the changewheel cover - this insignia simply being a reference to the number of spindle speeds and meaningless as to Model Type. 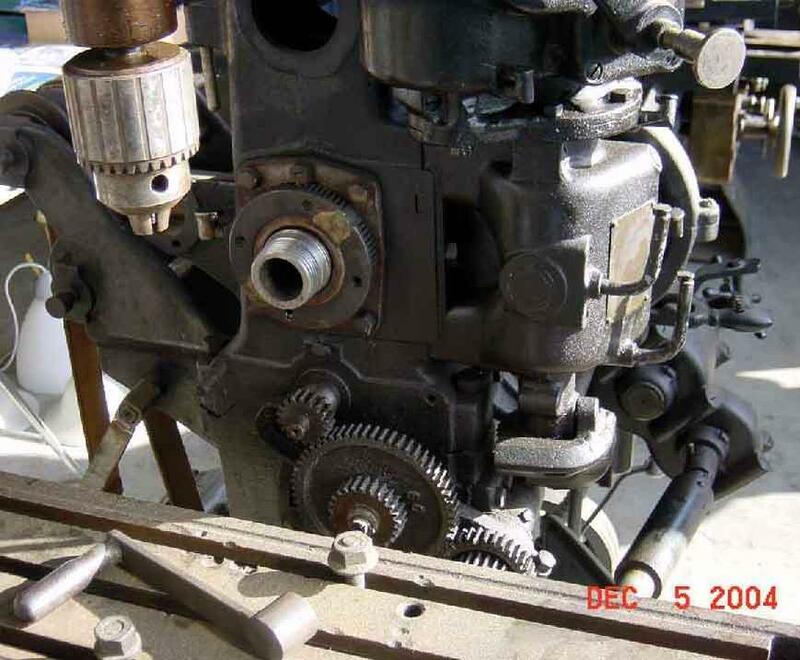 Dalton's ordinary lathes were of an absolutely conventional pattern and produced with swings of approximately 7, 8 and 9-inches; all were backgeared and had screwcutting by changewheels only - the jump to a gearbox-equipped lathe never being made. Not, in the modern sense, a mass-produced item, Dalton lathes had a lot of handwork in their manufacture and, although some small items like leadscrew clasp nuts and changewheels can be swapped over, major items cannot. An experienced rebuilder of these lathes reports that, having put together over twenty of them - and accumulated a good stock of spare parts - he never found an apron that would fit another saddle, nor a saddle that would fit exactly on another bed. The tumble-reverse mechanism was individually assembled on each machine and the mesh of the gears set before the holes were drilled for the spring-loaded plunger. The very earliest Dalton lathe found (it's being rebuilt now, in 2013) has a number of parts machined from the solid rather than from castings, this discovery showing that, in all probability, a number of prototypes were made (and subsequently) before the pattern were ready for the foundry. It is known that a number of Daltons were shipped to England during WW I (1914-1918) and when the Lusitania, a passenger liner, was torpedoed off the Irish coast by a German submarine there 200 of them in the hold. Most Daltons found in the UK are of the earlier type, Lot 2, 3, and 4 - but so far no Lot 5 and, it is believed, only one Lot 6. It seems that, once the conflict ended, demand for the machines fell away abruptly. Lot 1 "Combination machine" (shown lower down this page). Built from the very early 1920s until 1929 this was a large, special application machine aimed at the maritime industry and possibly employed on WW I submarines. They were available in a number of bed lengths from 48 inches up to 10 feet and incorporated a horizontal milling machine as well as a vertical milling and drilling spindle. Screwcutting was by changewheels only, no screwcutting gearbox ever being offered on any Dalton lathe. Short-lived and subjected to a number of changes as production gathered pace, Lot 2 lathes had a 6-inch swing with a 30-inch bed but were quickly replaced in the year of their introduction by a more useful 7¼-inch swing Lot 3 version. The rarest of all the Dalton lathes, their Serial numbers are low with just five Lot 2 and six Lot 3 discovered so far (2012). As a consequence, it is believed that production might have been limited to a span of just eight to twelve months. A feature exclusive to Lot 2 lathes was a top-slide that fitted over a post cast as part of the cross slide, rather than being bolted on (a system also used on the Drummond M-Type). The post had straight sides and inside the top slide base was a bronze locking mechanism activated by a square headed bolt that protruded through the casting to the right rear. The assembly was poorly designed and failed to lock the slide securely under heavy cuts. 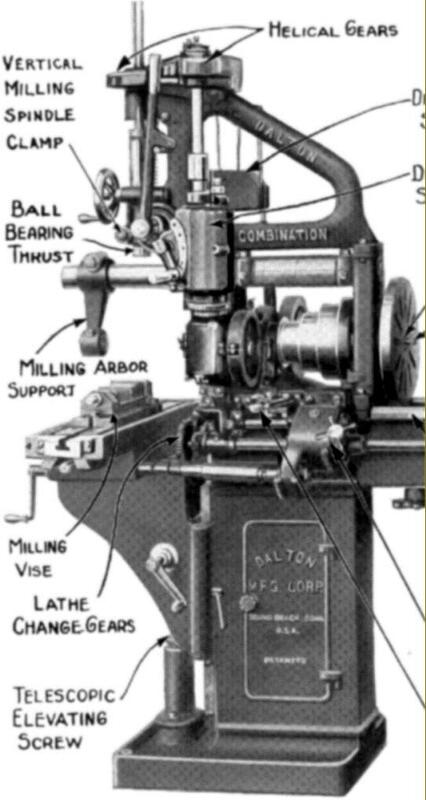 In 1914 Dalton introduced the heavier Lot 4 lathe - a date that coincides with the first of Hubert Dalton's patents (for a spring clip used to retain the locking collar that kept the changewheels on their studs; it was known as the "threadless nut"). Designed for home shop and hobby use, the Lot 4 is (with many thousands constructed) by far the most common of all Dalton types so far discovered. Although similar to the Lot 3 lathe (with the same 7¼-inch swing and using a few carried-over parts) they were of a more massive build being approximately 20% heavier with stouter castings and an improved spindle. The Lot 4 was the first model to offer, as an option, a 36-inch bed. The earliest Lot 4 lathes can be recognised by the use of the same "rough casting" top slide as used on the Lot 3 while later ones were fitted with the better-looking and more robust "ground-all-over" type used on all models until the end of production. First produced during 1922, the second most common Dalton, the Lot 5, could be had with either a 30 or 36-inch bed and the established 7¼-inch swing. 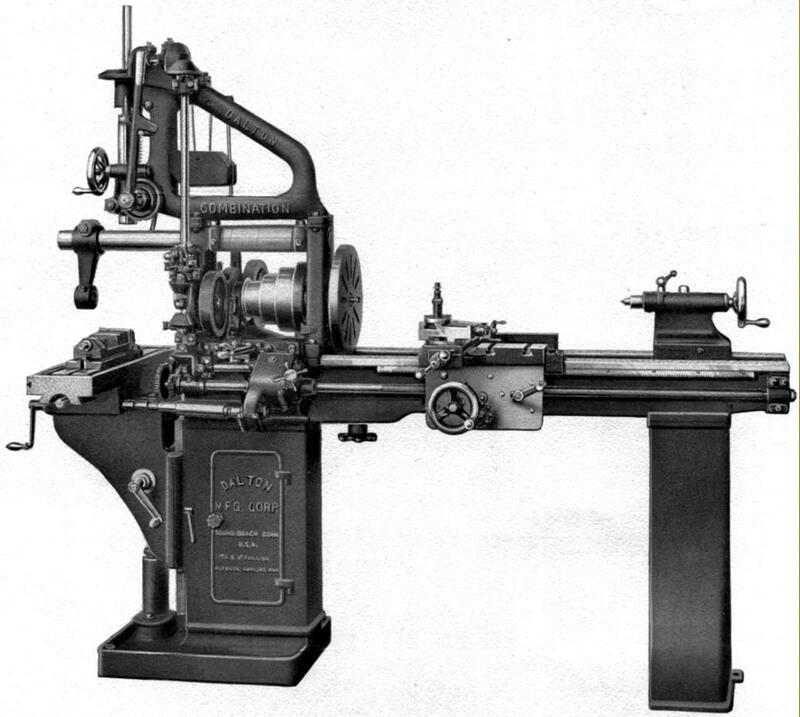 The lathe (it was an unfortunate, rather ugly-looking design) shared many components with the Lot 4, though with a much-improved specification including independent power longitudinal feed by a separate feed rod that drove, via a key, worm-and-wheel gearing inside the apron (though no small Dalton ever had power cross feed). Some very early Lot 5 lathes (probably fewer than 100) had a bed with its feet cast in and a number of components that were all were smaller and more lightly built than on later examples. This rarer type also incorporated a most useful automatic disengage for the power sliding feed, exactly like the contemporary and competing Flather 7-inch. Three examples have been examined: Serial Numbers 32, 36 and 62 all appear to have been identical and were fitted with a single-piece changewheel guard as used on the Lot 4 machines instead of the two-piece assembly found on the later Lot 5 types. The leadscrew used was the standard 3/4" x 12 t.p.i as used on all Daltons. Lacking other than a 1918 patent date, this larger 8½" x 36" lathe may well have been introduced in that year (non have been found with 1914 or 1917 patent tag dates). Heavily built, the Lot 6 lathe was intended for heavy-duty work and equipped with a hardened and ground spindle fitted with a substantial 17/8" x 8 t.p.i. nose thread. Available for bench or stand mounting several of the latter were offered including basic legs, heavy box-type pedestals, a single column plinth with foot-pedal and flywheel drive and another, very distinctive unit with two stout, cast-iron plinths and a line of three drawers across the top labelled Tools, Collets and Tools. Lot 6 serial numbers ran from just over 100 to well over 7000 with the great majority appearing to have been worn out during WW2. To date (2013), only fifteen have been found. Introduced in the early 1920s, the plain-turning T-L appears to have been a simple pattern-makers' lathe, one intended for both wood and light-duty metal work. Lacking both screwcutting and a speed-reducing backgear, this was the only Dalton with a 1.5" x 8 t.p.i. spindle nose and the spindle running direct in the cast iron of the headstock. An oil reservoir was formed below the spindle line with a simple bead chain, sitting in a grove half way along the bearing, being used to dip into and so fling the lubricant about. All T-L lathes so far found, no matter how badly abused, have spindle bearings in good condition - a confirmation that, with the right metallurgy and surface finish (as also widely used by South Bend) this arrangement (a steel spindle, preferably but not necessarily hardened, running directly in a cast-iron bearing) is a guarantee of a long and effective life. Oddly - though most usefully - for a pattern-makers' lathe the T-L was fitted with power longitudinal feed by a keyway-equipped drive rod operating through the usual worm-and-wheel mechanism within the apron (though no parts were interchangeable with Dalton metal lathes). Hubert Dalton's last patent, taken out in 1922, was for an effective lift-up-and-lock changewheel guard hinge and the registration number for this was cast into the bed. Although the same number can also be found on later machines of different Lot numbers, the T-L was the only model on which the hinge was used. Using just the changewheels supplied, seven rates of power sliding feed were available with the slowest giving a travel of 0.007" per revolution of the spindle. 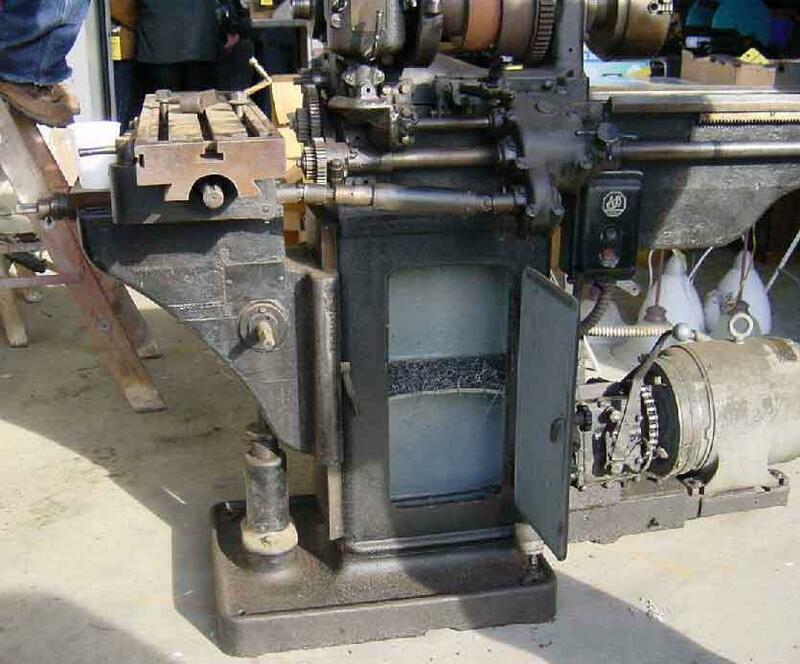 This 9 ½ inch swing lathe, with a choice of 36, 48 and 54-inch beds, did not carry a Lot number but, as all known patent numbers were stamped on its tag, must have been produced post 1922. The first really professional-standard lathe to be built by Dalton (other than the large Lot 1 combination machines) it was the first of the Company's products to have power cross feed - a simple push-pull plunger being used to switch between sliding and surfacing. 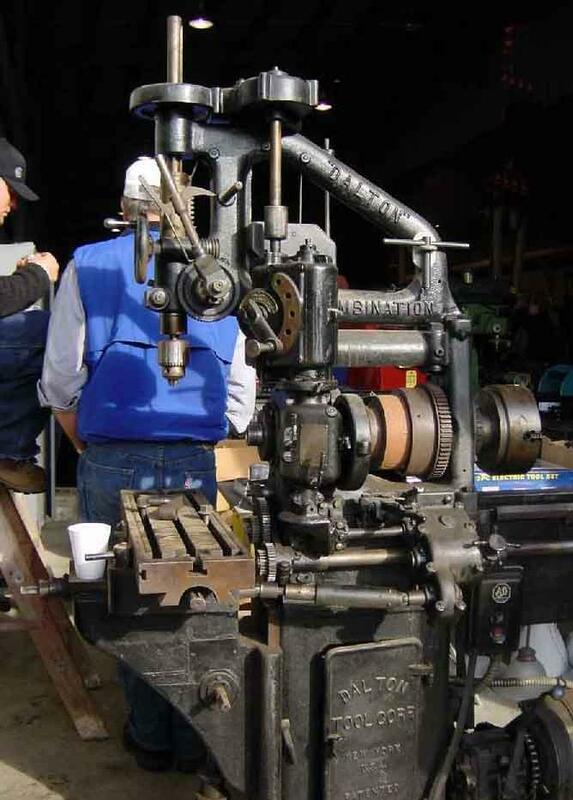 Ruggedly built, it was in much the same class as a South Bend 9-inch lathe, though a little heavier and with a larger spindle and better bearings and much more certain and easier-to-use apron controls. Although it had the appearance of a Lot 6 with the headstock and tailstock raised to give an increased swing, upon examination the Dalton Nine-by-Four proves to have been an entirely new machine with only a few minor parts carried over - for example the spindle, while having the same nose thread,, does not interchange. To date, only seven examples of this model have been found - with serial numbers ranging from 206 to 9024. The Nine-by-Four could be had as a bench lathe or stand mounted with a choice of simple bolt-on legs, a cabinet plinth and leg or on a very heavy, full cast-iron cabinet with drawers and doors for tool storage, each marked with cast-in lettering and as offered on the Lot 6 models. The usual range of countershaft drive systems was offered including a typical Dalton "high" system of great weight and complexity. Evidence sirvives that some examples were used in defence plants in California during WW II, and it may be that most found their way to this sort of use. With no spare parts to keep them running once broken or worn beyond use, they were probably turned into scrap metal for the war effort. Unfortunately, not all Dalton models can be precisely identified - and examples have surfaced where the exact type remains, for the moment, a mystery. One item that appears to have created most concern at the Dalton Company (and no doubt other manufacturers) was how to drive the lathes - the result being a remarkable variety of countershaft types. Some were of the conventional fast-and-loose design for bench, wall or ceiling mount while others were attached to the lathe headstock by inordinately high cast-iron pillars - a design intended to make the flat belt as long as possible and so improve its grip. Four version of the "high" countershaft have been found, all equipped with forward and reverse clutches with either a planetary reversing drive or a gearbox (with spur gears) driven by the motor. Other drive systems were rather neater and fastened to the back of the bed with a pair of jockey pulleys used to change the direction of the belt run from vertical to horizontal. Some incorporated clutch units while others had massive base plates and elegant belt guards. To date (2013), around 140 Dalton lathes have been discovered, a figure that might represent 1/3 of the total surviving. Hence, as these are relatively uncommon machines, if any owner has further literature, or photographs of their lathe, the writer would be interested to hear from you.. 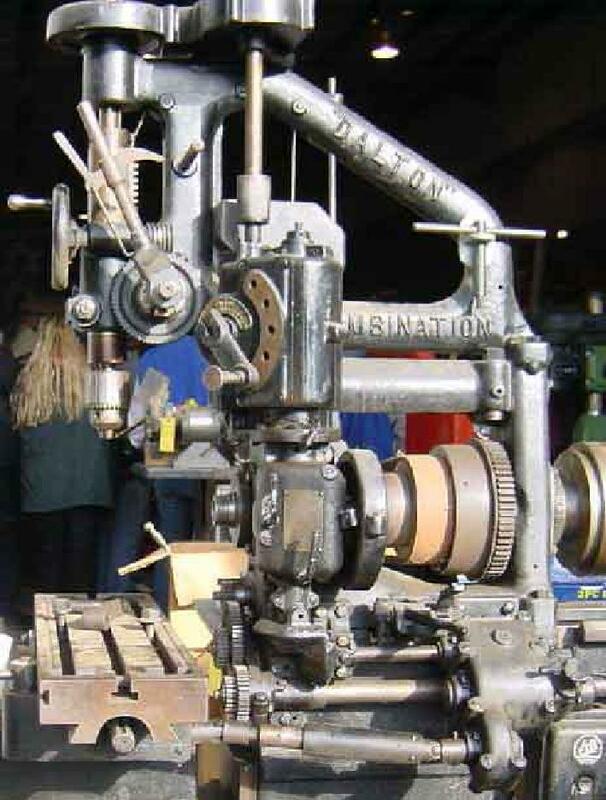 When your new Dalton Combination Machine arrived it was generally found to be supplied with a set of changewheels for screwcutting, a drive plate, large and small faceplates, a fixed steady, eight spanners, a crank handle to elevate the miller knee, a drill knock-out drift, a round drilling table with base to mount on the rectangular milling table, a plain milling vice, four clamp bolts, one milling arbor, an oil pot and driving belt. Annotated picture of the Dalton Combination Machine, designed, in this form, to be connected to overhead line shafting. This example is fitted with the optional 3-speed gearbox drive to the vertical head. One very unusual Dalton was the Combination Machine"- a large and heavy unit but based on a standard Dalton lathe bed and carriage; this model was obviously a new departure for the Company with elements of the design protected by patents taken out in July of 1921 and February of 1923. The lathe was originally advertised as being of: "special interest to garage and steam-ship owners" and was claimed to occupy: "one fifth of the space taken up by separate machines of the same type" and, of course, to need just: "one-fifth of the power to run" - although using all the combinations at once on the Dalton would have been impractical. 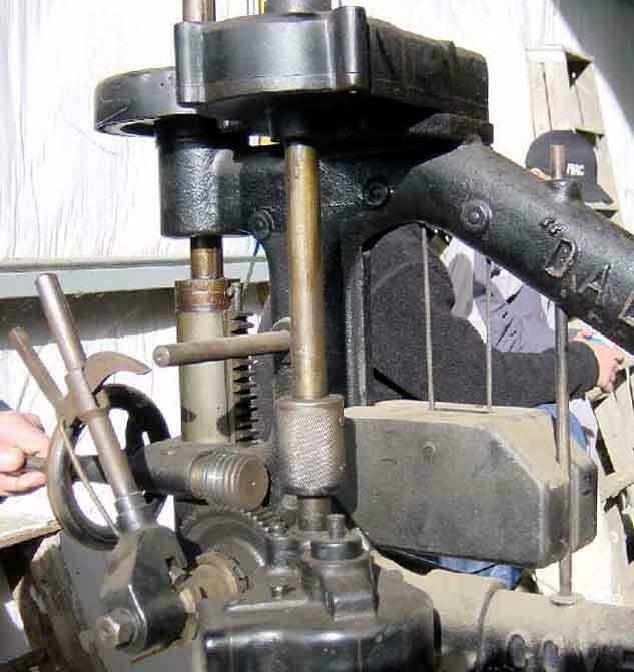 A detachable gap-bed, backgeared, 13-inch swing screwcutting lathe was the basis of the assembly and built onto the headstock end were a horizontal miller - with a powered 24" x 7.5" table - and a combined vertical milling and drilling machine. 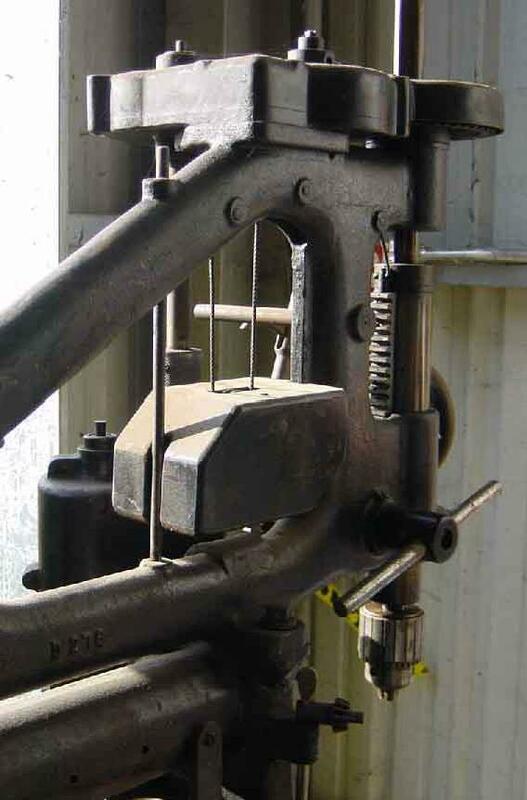 The most ingenious feature of the machine was the arrangement by which power was fed to the vertical milling head: the smaller of the two "backgears" on the headstock spindle drove not only backwards to the backgear "proper", but also outwards to a bevel box that transmitted the drive vertically - either through an optional 3-speed gearbox or directly through a dog-clutch - to a second set of bevel gears at the very top connected to the vertical milling spindle. Combined with the headstock cone pulley, backgear and built-in gearbox, this arrangement could give the milling and drilling head up to (an impressive) eighteen speeds. The arbor support overarm for the horizontal miller was made to pass through the top of the headstock and so, to an extent, stiffened the structure. The lathe admitted 37" between centres in the standard-bed version and 73" in the long bed - the latter being braced by a third leg positioned between the outer two. The 4 Morse-taper, phosphor-bronze bearing spindle had six speeds, between 20 and 441 rpm, a hole 11/16-inch in diameter and a spindle thread of 17/8" x 8 t.p.i. On the "Motor Drive" version a shielded 1.5HP motor drove first to a reversing countershaft unit which contained helical gears and clutches and then, vertically, via a three-step pulley and 2-inch wide flat belt which passed around wide, adjustable idler wheels (running on ball bearings) set behind the headstock; the idler wheels turned the belt through ninety degrees to pass horizontally to and from the headstock spindle. The lathe changewheels drove not only the 1-inch diameter 8 t.p.i. leadscrew for screwcutting and power sliding and surfacing, but also, though a 3-speed gearbox, the milling table power feeds. Because one motor drove the entire machine it was impossible to divorce cutting speeds from table-feed rates and, although the range was a "deep" as possible, it was still an unsatisfactory arrangement if optimum machining capability was required..
Rear View of the Dalton Combination Machine showing the unusually complex belt run arrangements and motor-drive-clutch unit. Dalton Combination Machine fitted with the self-contained "under-slung" motor-drive system that employed friction clutches engaging helical gears to provide forward and reverse to the lathe spindle and other rotating parts. This machine has the simpler and cheaper direct shaft-drive to the vertical head through a dog clutch. Pictures taken in late 2004 at a farm sale in Oregon. This particular example had the 8 foot bed and was described as "one big machine". Unfortunately it was in very poor condition with many parts missing or broken - and evidence in the form of brazed repairs to the main casting that it may have fallen over. Because the backgears were missing a previous owner had taken the once popular route of using a motorcycle gearbox in the transmission (in this case from a Harley Davidson), to provide a range of slow speeds.